"Somebody to Love" (originally titled "Someone to Love") is a rock song that was written by Darby Slick. It was originally recorded by The Great Society, and later by Jefferson Airplane. 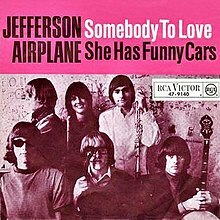 Rolling Stone magazine ranked Jefferson Airplane's version No. 274 on their list of the 500 Greatest Songs of All Time. Written by The Great Society guitarist Darby Slick after realizing his girlfriend had left him, and first performed by that band, which included his then-sister-in-law Grace Slick on vocals, the song made little impact outside of the club circuit in the Bay Area. The song was released in 1966 as a single with the B-side another Darby Slick composition titled "Free Advice" on the North Beach subsidiary of Autumn Records, and received minimal circulation outside of San Francisco. San Francisco in the mid-'60s was the center of free love, but Darby Slick saw a downside to this ethos, as it could lead to jealousy and disconnect. This song champions loyalty and monogamy, as the singer implores us to find that one true love that will nurture us and get us through the tough times. When Grace Slick departed to join Jefferson Airplane, she took this song with her, bringing it to the Surrealistic Pillow sessions, along with her own composition "White Rabbit". Subsequently, the Airplane's more ferocious rock and roll version became the band's first and biggest success, reaching No. 5 on the Billboard Hot 100. The group's first hit song, "Somebody To Love" was also one of the first big hits to come out of the US West Coast and San Francisco Bay area counterculture scene, to which numerous artists and musicians would be drawn over the following few years. Slick's original performance of the song with The Great Society is more subdued, with the Jefferson Airplane version sounding far more accusatory and menacing on lines such as "Your mind is so full of red" and "Your friends, baby, they treat you like a guest." The lyrics are in the second person, with each two-line verse setting a scene of alienation and despair, and the chorus repeating the title of the song, with slight variations such as: "... / Don't you need somebody to love? / Wouldn't you love somebody to love? / ..." Like the album on which it appeared, this song was instrumental in publicizing the existence of the Haight-Ashbury counterculture to the rest of the United States. 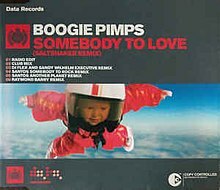 A cover of "Somebody to Love" was the debut single of German electronic music duo Boogie Pimps. It was released on January 11, 2004 and reached number three on the UK Singles Chart and number seven on the Irish Singles Chart. The song also became a top-twenty hit in Australia, Denmark, Finland, Germany, and the Netherlands. In most of these territories, this was their only hit single, as the follow-up single "Sunny" failed to chart. ^ Starr, Larry (2008). Rock: A Canadian Perspective. Oxford Univ Pr. p. 175. ISBN 978-0195427615. ^ a b c d "500 GREATEST SONGS OF ALL TIME". Rolling Stone. ^ Richie Unterberger. "Darby Slick | Biography & History". AllMusic. Retrieved 2016-10-01. ^ a b "Somebody To Love by Jefferson Airplane Songfacts". Songfacts.com. Retrieved 2016-10-01. ^ "Nederlandse Top 40 – Jefferson Airplane" (in Dutch). Dutch Top 40. Retrieved December 10, 2018. ^ "Boogie Pimps – Sunny (song)". australian-charts.com. Retrieved December 14, 2018. ^ "Australian-charts.com – Boogie Pimps – Somebody to Love". ARIA Top 50 Singles. Retrieved December 14, 2018. ^ "Ultratop.be – Boogie Pimps – Somebody to Love" (in Dutch). Ultratop 50. Retrieved December 14, 2018. ^ "Danishcharts.com – Boogie Pimps – Somebody to Love". Tracklisten. Retrieved December 14, 2018. ^ "Boogie Pimps: Somebody to Love" (in Finnish). Musiikkituottajat – IFPI Finland. Retrieved December 14, 2018. ^ "Offiziellecharts.de – Boogie Pimps – Somebody to Love". GfK Entertainment Charts. Retrieved December 14, 2018. ^ "The Irish Charts – Search Results – Somebody to Love". Irish Singles Chart. Retrieved December 14, 2018. ^ "Nederlandse Top 40 – week 12, 2004" (in Dutch). Dutch Top 40 Retrieved December 14, 2018. ^ "Dutchcharts.nl – Boogie Pimps – Somebody to Love" (in Dutch). Single Top 100. Retrieved December 14, 2018. ^ "Official Scottish Singles Sales Chart Top 100". Official Charts Company. Retrieved December 14, 2018. ^ "Swisscharts.com – Boogie Pimps – Somebody to Love". Swiss Singles Chart. Retrieved December 14, 2018. ^ "Official Singles Chart Top 100". Official Charts Company. Retrieved December 14, 2018. ^ "Official Dance Singles Chart Top 40". Official Charts Company. Retrieved December 14, 2018. ^ "ARIA Charts - End Of Year Charts - Top 100 Singles 2004". ARIA. Retrieved December 14, 2018. ^ "ARIA Charts - End Of Year Charts - Dance Singles 2004". ARIA. Retrieved December 14, 2018. ^ "The Official UK Singles Chart 2004" (PDF). UKChartsPlus. Retrieved December 14, 2018. ^ "ARIA Charts – Accreditations – 2004 Singles". Australian Recording Industry Association. Retrieved December 14, 2018.